Nut seller in Mumbai, India submitted to ‘Inspiring Experiences’ on National Geographic. Kristian Bertel has contributed to the National Geographic Your Shot community with an assignment called ‘Inspiring Experiences‘. This assignment curated by David Y. Lee, a producer at Nat Geo Your Shot and Jenn Poggi an assistant professor they are inviting us to share photos and stories inspired by our experiences. As Dan and Jenn are saying it: ”- We challenge you to take the idea and run with it. What are some of the most defining experiences in your life? Perhaps it’s a trip you took, a relationship you built, or a milestone you achieved. Use your photography to tell us a visual story, and then take advantage of your caption to give us context for that moment”, they say. Photography is like a language. How to experience a language depends on our own childhood and background, culture, life experience, age or how deep we understand our language. Perhaps we are learning a new language? An image appeals to every human in different ways. Photography is like a language. our personal experiences color not just the pictures we take, but also the pictures we see. All of us see the world in completely different ways. On the photographer’s journeys to India it was inevitable not to notice the mystic and magical places of India that was seen all around the cities and villages. Based on various definitions of mysticism, namely mysticism as an experience of union or nothingness, mysticism as any kind of an altered state of consciousness which is attributed in a religious way, mysticism as “enlightenment” or insight, and mysticism as a way of transformation, ‘Mysticism’ can be found in many cultures and religious traditions, both in folk religion and organized religion. These traditions include practices to induce religious or mystical experiences, but also ethical standards and practices to enhance self-control and integrate the mystical experience into daily life in India. 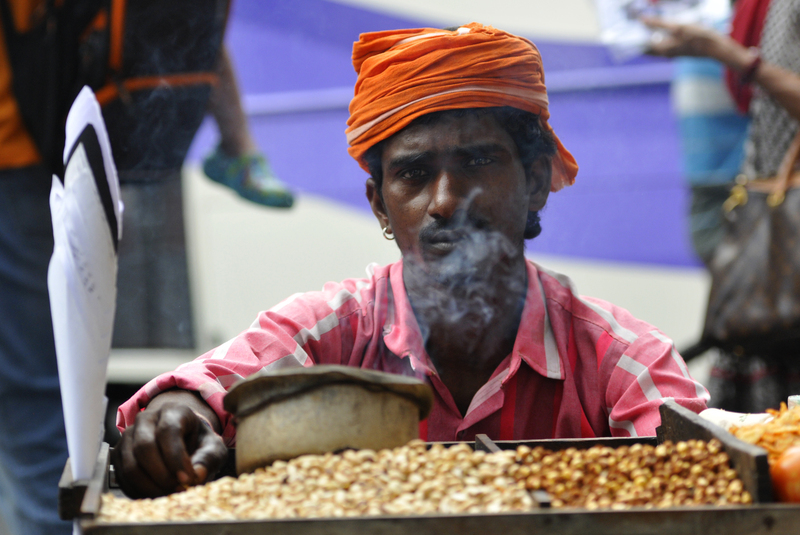 In India, one can make life changing experiences by seeing the spirituality in the country of origin as seen in the smoked photo of a nut seller in Mumbai, where smoke is arising in front of him. And as a photographer traveling in India he was experiencing the mystical India, a spiritual journey to India up close. old temples, Maharajah palaces, ashrams, National parks with Wild animals and fascinating mountain landscapes and colorful markets with spices and nuts. Nuts are an important source of nutrients for both humans and wildlife. Because nuts generally have a high oil content, they are a highly prized food and energy source. A large number of seeds are edible by humans and used in cooking, eaten raw, sprouted or roasted as a snack food. Nuts or seeds generally are also a significant source of nutrition for wildlife. This is particularly true in temperate climates where animals such as jays and squirrels store acorns and other nuts during the autumn to keep from starving during the late autumn, all of winter and early spring. the photographer Kristian Bertel says.